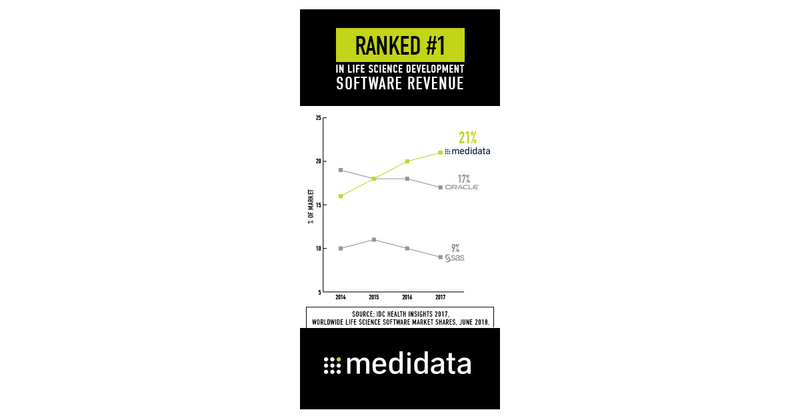 NEW YORK–(BUSINESS WIRE)–More than 15,000 studies have been conducted on the Medidata Cloud, the Intelligent Platform for Life Sciences, Medidata (NASDAQ: MDSO) announced today, making it the industry’s largest data repository. Ranked as the global leader in life science development software revenue1, this milestone highlights the company’s position and experience in the market. Building upon the most comprehensive data assets in clinical research, Medidata applies artificial intelligence and advanced analytics to deliver meaningful insights to over 1,000 customers across every therapeutic area and clinical phase. More than 100,000 professionals are certified on Medidata’s platform, and over two million eLearning courses have been completed since 2010. The velocity and variety of data is accelerating in clinical trials, making integration and standardization more complex than ever before. To solve for this, Medidata created the Medidata Enterprise Data Store (MEDS), the largest clinical data repository with more than 4.4 million patients. Powered by AI, MEDS leverages innovative technologies to streamline labor intensive steps and improve decision making in the design, execution and review of clinical trials. “With the life science industry under strong pressure to more quickly and efficiently bring new drugs to market, the clinical trial ecosystem is rapidly evolving and expanding. Medidata is continuing to aggressively invest in growth by strengthening interoperability, adding new capabilities, and expanding access to their platform,” says Alan S. Louie, Ph.D., research director, life sciences, IDC Health Insights. Learn more about the Medidata Cloud. Join over 1,000 life science leaders at NEXT NYC on October 24-25. Register today.